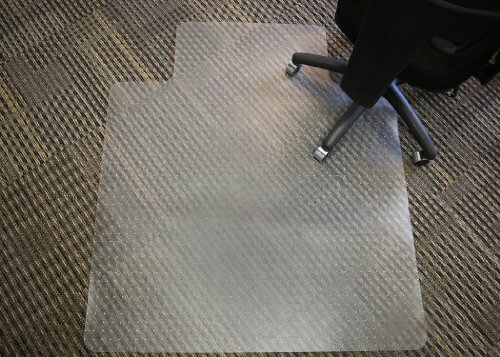 Ideal for IT, or other electronics heavy offices, the Anti-Static chair mat protects more than just your carpets. These mats prevent the buildup of static charge generated by rolling wheels or shuffling feet. The charge is dispersed across your floor and helps keep dust away from equipment. The PVC plastic material is among the best available, providing long-lasting durability without odor. It also prevents carpet fading and discoloration with superior UV protection while being virtually clear. Despite their name, Mammoth mats are lightweight and easy to move and clean. The gripper floor side holds the mat in place without damage and is designed for standard pile (3/8" thick or less) carpeting. The 36" x 48" rectangular shape includes a lip to fit neatly and securely under a desk, a small investment to protect your office from static and wear and tear. Top-of-the-line durability means long-term protection for your floors. More than just durable, they're safe and environmentally friendly! This Mammoth chair mat is constructed using 30% renewable energy; it is 100% recyclable and made from up to 25% recycled material. Thanks to extensive R&D, all materials used are free of dangerous and toxic Phthalate plasticizers.